I intend to offer jam jars this autumn and I thought that labelling them in a personal way would add something nice to the gift. I used water paint markers, 0.7 mm white and 0.9 to 1.3 mm color, to handwrite on the glass. The marks are easy to remove, which makes the jars reusable. She, who named my jams “Les confitures de JJ” (JJ’s jams) with such warmth in her voice this summer, inspired me and I decided to sign the jars this way. May them bring joy wherever they go. 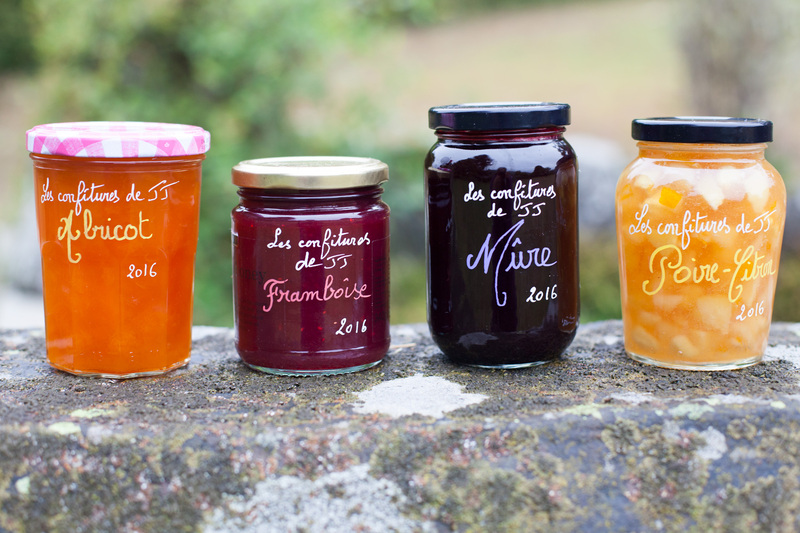 Yellow, red and black fruit: apricot, raspberry, blackberry and pear and lemon jams. Photo 18 September, Saint-Simon, France. This entry was posted in Eat and tagged All-fruit, France, Saint-Simon by Les Jardins d'ici. Bookmark the permalink. Tu fabriques tes confitures ? Oui, pour la famille et les amis. J’essaierai d’en mettre un ou deux pots dans mes valises lorsque je vous rendrai visite. Sinon je trouverai bien un moyen de vous en faire passer!